This double bath is located on the right side of the present-day Sokollu Primary School, which was built as the Valide-i Atik Tabhanesi and later transformed into Üsküdar Military High School. Sultan III. His mother, Sultan II. Selim’s wife, Nurbânu Sultan, was built in 1583 by Mimar Sinan together with the Atik Valide Complex. 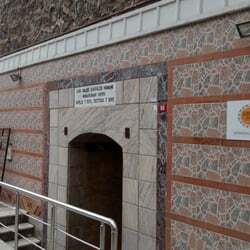 The main gate is on a narrow gap leading to the old Toptaşı Street. Shops and shops were built on the street side.